Educated Romans were avid readers of history, and historical writing played a significant part in the elite literary culture of republican and imperial Rome. Those who tried their hand as historians included major public figures who had themselves made history, such as Cato the Elder, Julius Caesar, and the emperor Claudius. Many Roman historians were senators who took up writing in retirement and re-fought old political battles with the pen. Famous examples were Sallust and Tacitus. Others were purely literary figures, who made their name by writing, and attracted generations of readers with their eloquent narratives of great men and noble deeds. Such a man was Livy (Titus Livius, 59 BC – AD 17), arguably the greatest of all the Roman historians. Sallust, Tacitus, and Livy are well known because their works survive for us to read; but that is true only in part, because the works in question are not fully preserved. In fact most of Sallust’s work is lost, as is the majority of Livy’s great history (only 35 books survive from a total of 142). As for Tacitus, just over half of his major historical works survive, in two separate portions, each preserved more or less by chance in a single incomplete manuscript. We are fortunate indeed that we possess as much as we do of the works of these historians, given that the preservation of ancient books depended on handwritten copies, and copies of copies, from the time they were first composed until the invention of printing when their permanent survival was assured. The extant portions of Sallust, Livy, and Tacitus actually represent the tip of an iceberg, as three survivors from a vast body of historical literature that once circulated in manuscript copies but was lost or destroyed in late antiquity and the Middle Ages. 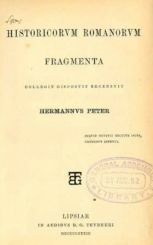 Attempts to gather this fragmentary material together into a single edition began in the sixteenth century; but the standard edition that has been in use up to the present day was produced in the nineteenth century by the German scholar Hermann Peter (1837–1914). Peter’s edition was excellent for its time and represents the best of nineteenth-century German scholarship; but it is now completely outdated, and the need for a modern replacement is widely recognised. Moreover, since it presents the texts only in the original Latin and Greek, with commentary in Latin, Peter’s edition is inaccessible to many of today’s potential users. 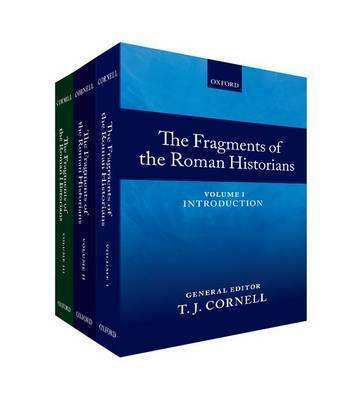 It was more than fifteen years ago (actually in 1996) that the idea was first mooted of forming a collaborative project to produce a new edition of the Fragments of the Roman Historians. When first approached I naturally replied that nothing on earth would persuade me to take on such a daunting task—which is how I ended up as Director and General Editor of the project, and with my name on the cover of the new three-volume publication (Oxford University Press, 2013). The Fragments of the Roman Historians is actually the work of a team of UK-based scholars from several universities, so my task was a straightforward one: to coordinate the efforts of ten serious and independent-minded academics, and to produce abalanced and uniform result. Of course it was a piece of cake: not a bit like herding cats. The project has been based in Manchester from the start. Meetings of the group were held in Manchester, and were initially funded by small grants from the Faculty of Arts (as it then was). Three of the contributors were Manchester-based: myself, John Briscoe (now honorary Research Fellow in Classics and Ancient History), and Simon Northwood, then a PhD student, now a Secondary School teacher. The three of us actually contributed some 45% of the total of 1.05 million words (occupying 2650 pages altogether). The work consists of a general introduction and introductions to the lost historians (in volume 1), critical edition of the fragmentary texts with facing English translation (vol. 2), and detailed up-to-date commentary (vol.3). Our aim throughout has been to present the evidence as clearly as possible, to stress its limitations, and to point out the difficulties and problems that it presents. We want to make this formerly abstruse and intractable material accessible to everyone—general readers, students, and researchers alike—and to provide them with the means to conduct their own research and make their own decisions about how the fragments are to be understood and interpreted. 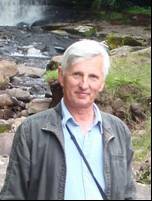 This entry was posted in History, Publications, Roman History on 23/01/2014 by pal29. Can’t wait to see this in my University Library. A really excellent publication, and useful too.